The Syrian government congratulated Iraq on the full liberation of the city of Mosul from Daesh terrorist group, the Syrian Foreign Ministry said in a statement Monday. BEIRUT (Sputnik) — On Sunday, the anti-terrorist unit of the Iraqi armed forces raised a national flag on the banks of the Tigris River in the historical part of the city of Mosul. The same day, Iraq's Prime Minister Haider Abadi arrived in Mosul to declare the city's liberation from Daesh. "Syrian leadership congratulates the Iraqi people and their government on great victory over IS [Daesh], which was achieved by the Iraqi army and militias in Mosul," the ministry was quoted as saying by Syrian Arab News Agency (SANA). The ministry added that the Syrian government stood in solidarity with the Iraqi people and armed forces and was determined to continue the joint fight against Daesh and any other form of terrorism in order to prevent its spreading in the region. "The defeat of IS in Mosul is a prelude to a defeat of everyone who founded, armed and supported them," the communique said. In 2014, Daesh captured vast territories in Iraq and Syria, declaring the establishment of a caliphate in the seized areas. Mosul has served as Daesh's so-called capital in Iraq since then. The Iraqi operation to liberate the city began in October 2016. In June, 2017, the Iraqi command announced the beginning of an offensive on the last fortifications of Daesh in the historical part of Mosul. The operation involved special troops, federal police, rapid reaction forces and the armed forces of Iraq. On June 29, Abadi declared the recapture of Al Nuri Grand Mosque in Mosul, where the creation of the so-called Islamic caliphate was first announced by the Daesh leader in 2014. Abadi claimed it was the end to the organization’s existence. 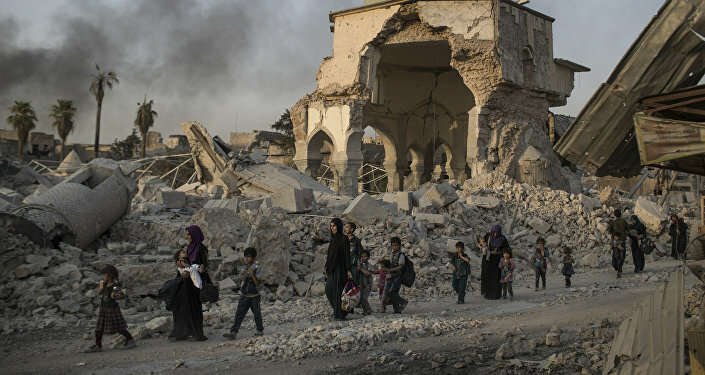 The same day, US-led coalition's spokesman Ryan Dillon said the full liberation of the city might be achieved within days.